Did you know there are now FOUR Attention Grabber Books? The first piece from Book Three is a hit with all ages. 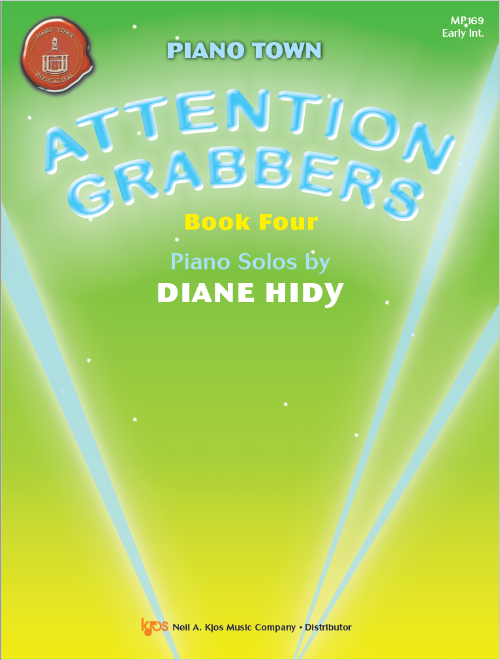 "My students are thoroughly enjoying Diane Hidy's Attention Grabbers, especially Book Three, for early intermediate level, that is another winner. This series was created for students with ADD (Attention Deficit Disorder), for whom established repertoire is not compatible. In Hidy's words, these pieces were born "out of desperation," and from her years of teaching experience, she discovered what lies naturally under the fingers. "From the moment this book is in your hands, you and your students will want to open it up and explore the contents. The cover is interesting, colorful, (bright purple and orange) and inviting! There are nine catchy pieces, Mashed Potato Clouds, San Francisco Morning, Steampunk, and Jellybean Jump, to name a few. The composer wrote these pieces for her students with ADD, and tested them out with her students of all abilities, including more typical ones. The pieces sizzle with pizzazz! They are two-three pages long, designed to be easily learned and remembered, with their infectious rhythms and melodies. There is a good balance of pieces that stay in one hand position, to hand crossing and hand position shifts. Each piece has an attractive hook, as in pop songs." Tango Taboo from Attention Grabbers Book Three. Mashed Potato Clouds from Attention Grabbers Book 2. National Federation of Music Clubs Bulletin selection 2014-2016. 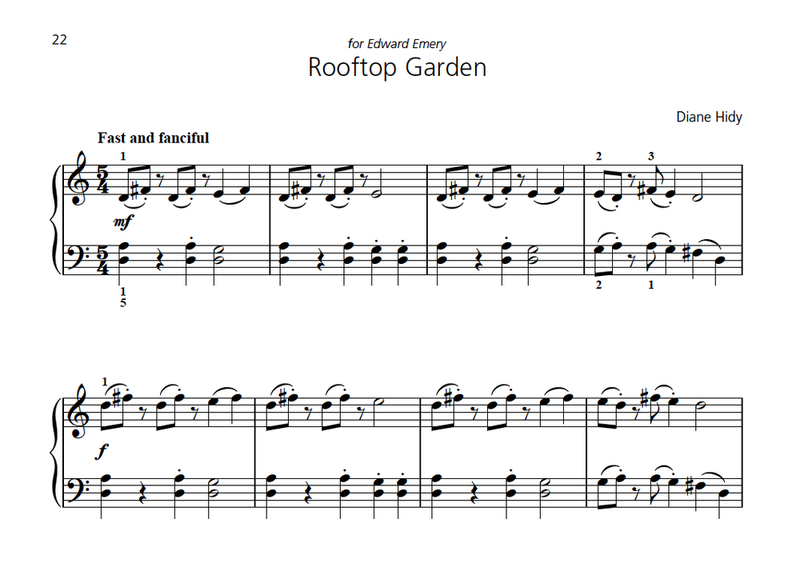 The beginning of Rooftop Garden in Attention Grabbers Book 2. 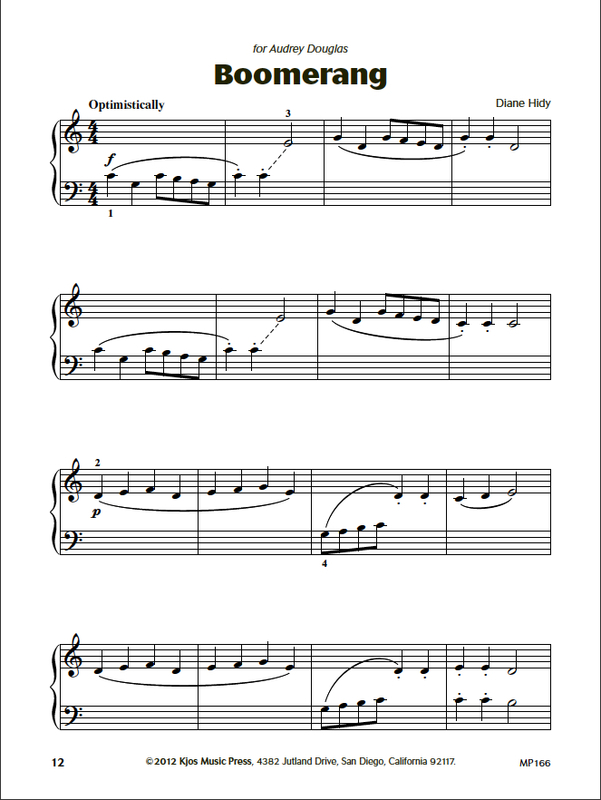 The piece also has a lyrical middle section which contrasts with the outer sections and sets up a dramatic ending. While these pieces were inspired by my students with ADD (Attention Deficit Disorder), they have been thoroughly tested by a broad range of students, including more typical ones. These students have become my best editors, finding the trouble spots and educating me about what makes a piece work. Did you notice how the pick-ups are printed? Each phrase is a complete thought on one line - easier for any student to understand and play correctly. It sizzles with pizzazz. The pieces have infectious melodies and rhythms designed to be easily learned and remembered. It looks like what it feels like. There are no "surprises" in the score to trip or frustrate a student. It feels good in the hands. The patterns are compelling and just challenging enough. Crossing hands and hand position shifts that are both comfortable and interesting are a plus. It uses intriguing patterns interrupted only by unforgettable, significant changes - ones that are such fun to play that they're worth remembering. a snazzy rhythm, an inventive sound created with the pedal, a physically "sticky" feel. 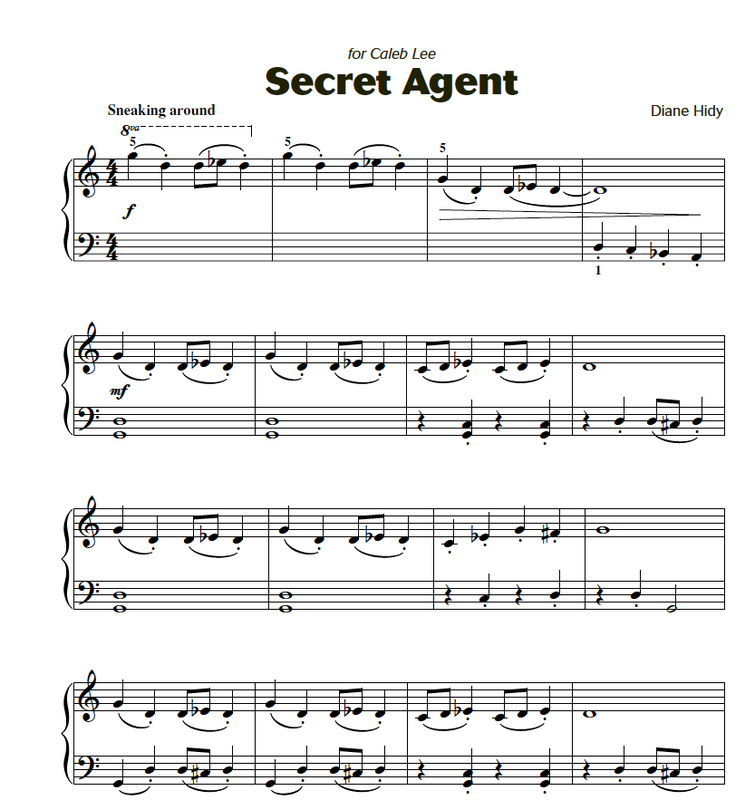 Secret Agent is a great transitional piece. Both boys and girls love its dramatic flare and quick (but not difficult) hand position changes. From Attention Grabbers Book 2. Boomerang from Attention Grabbers Book One. "I just wanted to let you know that Audrey played those 3 pieces twice for her Dad last night, twice before breakfast this morning (and had to be stopped to eat and get out the door), and plans to play them again as soon as she gets home tonight. It's not hard to get her to practice, but...voluntarily doing anything in the morning is rather unusual." 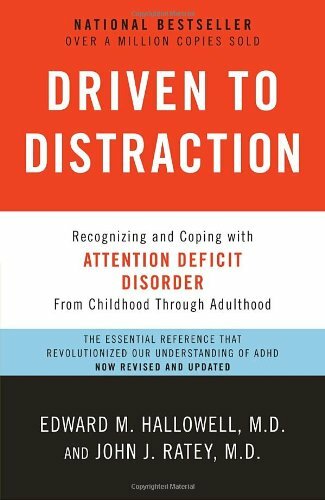 Driven to Distraction helps me understand how attention issues affect people and how I can best help them. I highly recommend this book for anyone dealing with student or family members with ADD.